Search our wide selection of printable weekly calendar pages. We all need different types of calendars for our every need. If you decide that you want to organize your life by the week, then print these calendars and have fun in setting your weekly schedule. 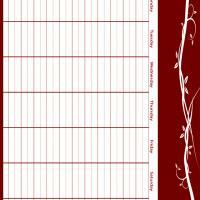 These sheets are easy to print and use, and will help you to remain as organized as possible. All you need is a computer, printer, and an internet connection. You can print all of the pages from this section out for free, as well as the items from our other categories. Are you looking for a new way to keep organized? 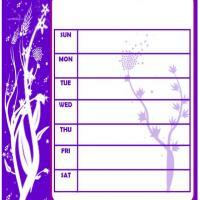 Need a place to write down all of the plans you make? 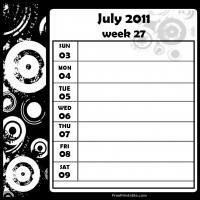 Once you have these printable weekly calendar sheets, you can put them together by binding them, or just putting them in a regular binder or folder to carry along with you at all times. If you have a hectic lifestyle, this is definitely the way that you should go. Take advantage of them today, since they are entirely free of charge for you to print, along with all our other printouts. Consider printing out a large stack of our printable weekly calendar sheets, so that you do not run out quickly. Or, you can laminate one or two and use a special marker so that you can erase the contents once the week is done, and then reuse it. These printable weekly calendar sheets will come in handy for any one, however. We hope that you can get a lot of use out of the printable weekly calendar pages, as well as some of the items from our various categories. If you are ever in need of invitations, cards, coloring sheets, or similar things, then check out our quality selection here.